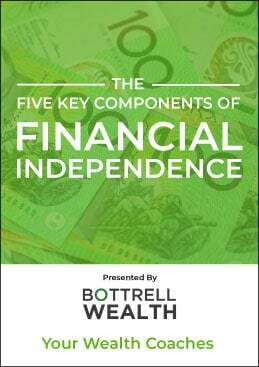 Less than 10% of Australians achieve financial independence. Gain financial independence by following 5 easy steps which we outlay in our free eBook – Grab yours today! You never know when something unexpected can happen. It is important to protect yourself and/or your business, to ensure minimal damage is done. Find out how we can help. We can assist you with financial planning. We focus upon three key sectors of financial planning, including retirement planning, superannuation and wealth creation, and investment advisory. Having a financial plan that has proven tax strategies in place not only ensures your future accomplishments, but puts in place a structure that positively affects all aspects of your assets. Bottrell Wealth have a reputation for delivering quality advice, maintaining strong relationships and offering innovative approaches to make your money work for you. We provide a full range of Financial Planning services, including Investment Advice, Insurance and Wealth Creation, allowing our clients to achieve their business and personal goals. Whether for personal or business, having the correct insurance is vital. Make sure your covered. The term Life insurance covers the definition of a substitute for an individual’s income if they are to die. Relieve your family with their peace of mind. If you are suddenly unable to work, either via sickness or an accident, Income Protection Insurance is an alternate source of cash flow. Find out your options today. Regardless of the scale of a business, every company has crucial figures that keep your cash flow coming in. Imagine if they left? Get insurance on your side. Bottrell Wealth Pty Ltd are authorised representatives of GPS Wealth Ltd, where we can provide financial planning services. GPS Wealth – ABN: 17 005 482 726, Australian Financial Service License: No 254 544. Please see the below links to aid your navigation of our website.